CSV – My Friend! | Forget the drama! Coconut Sap Vinegar (CSV) is really my friend. Why? All organic and natural products from my kitchen are all my friends. They are helping me to heal my body and giving me peace of mind every time I am preparing foods not for me, but to my family as well. Before coconut vinegar become well-known just like Apple Cider Vinegar, I believe that I my ancestors are using this already. I came from a land of coconuts! I came from a family of coconut farmers where it is our main source of income. That’s why, since I was a kid, I’ve already known the benefits of coconut plant from roots to tips. I grew up and witnessed that my grandma and mama are only using coconut vinegar to most our dishes. I couldn’t agree more with Mike. To be honest, I never knew that there was coconut vinegar made from coconut water not until last year my brother-in-law told me. He knows how to make a vinegar from coconut water and I discovered that vinegar from coconut water is not pure. He said there is a certain recipe on how to make a coconut water vinegar which is adding sugar and yeast to coconut water. 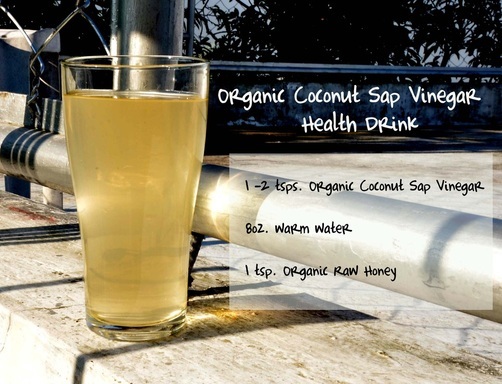 So, coconut sap vinegar is literally different from coconut water vinegar. Coconut vinegar maybe better than Apple Cider Vinegar because it comes from naturally higher in minerals and other phytonutrients. “It’s high in potassium, for example, and also quite abundant in a naturally-occurring probiotic called FOS. Although vinegar is chemically acidic, it is believed to create an alkalizing effect inside the body during digestion, probably due to its high content of alkalizing minerals. Think about this, too: Coconut trees grow near mineral-rich ocean waters, so products derived from coconut trees are often very high in natural minerals (because the soils near the ocean are high in minerals themselves). Always buy from local or coconut farmer because it is definitely organic, fresh from the plant and very cheap. Imagine one gallon costs only 50Php. But if you’re living in the city you can visit the Salcedo Weekend Market, located at Jaime Velasquez Park, Leviste Street, Salcedo Village, Makati City. It’s open every Saturday from 7am to 2pm. But if happen you are living outside the Philippines you can visit the Asian Store, it’s definitely available there. Coconut vinegar adds healthy, delicious flavor to salads, veggies and most foods. You can use for it for household cleaning. It is effective in removing clogs from drains and ungluing sticker-type price tags. Have you tried using this kind of vinegar? Will you try to consider using this? Please tell me in the comment section below. Real food is my best friend. You’re right, CSV is healthy. Being from Samar, my family is also used to coconut sap vinegar. I’m currently using apple cider and they are imported from US. It’s good to know that I now have better locally made option. Thanks. yup I am also using Apple Cider Vinegar (Bragg’s ) when I ran out of CSV. I have not tried using CSA. I would try to find it or an alternative real vinegar to use for home cooking. Thanks for sharing about the CSA. Ito yung tuba muna bago maging suka right? Nakakamiss ang all-natural na suka/CSV. My family uses this type of vinegar too, including sukang Iloko. And I advocate buying our own products which will certainly augment the income of the local farmers. I am not sure if I have tried this. I think I need all natural products in our home, especially since we have kids. I am considering buying ACV. But I hope our palengke has CSV. Haven’t heard of this CSV until today. We take apple cider vinegar every morning because of the healthful effects. I think we have to look for and see what CSV can bring to our body. Do they have the same taste? I must admit I am not adventurous when it comes my condiments. Will definitely try this. This is a new information for me and it is nice to know that CSV is good for the health. True. For 50 pesos, you get a lot of vinegar already and it gets better with time. There is a nice zing to coconut vinegar. Love to explore more about CSV Sis and thank you so much for great information you’ve shared here. Healthy for food and drink and great for household cleaning as well. So nice! This is the first time I have heard of CSV. It has a lot of uses! It’s my first time hear about CSV. Is it available at the supermarkets? I’ll definitely look for it and try it. We are using ACV at home. I will look CSV and have a try too.